One-story-plus-attic bungalow with side gable roof, and front gable central dormer. German siding, engaged full-width front porch with four tapered square posts resting on solid brick piers and balustrade. Exterior end brick chimney, four-vertical-over-one windows. Set up on a hill with low stone retaining wall, stone steps, and flanking brick piers at head of the stairs. James T. Thompson and wife Florence lived here from 1937 to 1938. They were associated with the Jo-Ann Beauty Shoppe. J. Ransom Cantrell, a painter, and wife Mary lived here from 1939 to 1940. Mrs. Matilda Jenkins, widow of James E. Jenkins, lived here from 1941 to 1942; Reverend Huggins and wife Grace lived here from 1943 to 1949, along with J. Hilliard Henderson and wife Millie. Henderson was a salesman at Patterson's Department Store. 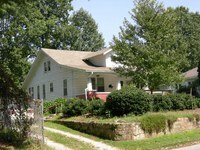 Clarence N. Barnwell, a bookkeeper at Anders & Bennet, Inc., a concrete company, lived here with wife Elaine and Mrs. Sue Melton, a nurse, from 1950 to 1951. From 1952 to at least 1953, John G. Dill, a driver with Hendersonville Supply & Coal Company, lived here.